21 members of the Friends of the Simpson Desert Parks and 11 vehicles attended this year’s working bee. The weather this year was fantastic with temperatures reaching from the low to mid twenties most days, unlike last year’s event which had to be cancelled due the unseasonable rain. We welcomed 2 new members, who were attending their first working bee and welcomed back 4 other members – one who had not been for approximately 21 years. number of tourists visiting the area. The use of the area adjacent to the Workshop for the FOS group proved to be well received and further investigation and discussion will take place to establish a more permanent campsite area here for the workers. With aid of a South Australian Government Grant, FOS purchased 2 handheld GPS units, 2 braziers and heat beads, additional pruning equipment, water timers, poly piping and fittings, and fuel vouchers. The comfort given by the purchase of the braziers and also having the ability of having the right material and tools for the each of the projects was a benefit to all attendees. The addition of fuel cards was appreciated by members and assisted with their fuel expenses. The least distance travelled by any member of FOS this year was just over 3,000km and those who travelled across the desert first, travelled just over 4,000km. dangerous position for the many tourists who visit the area. 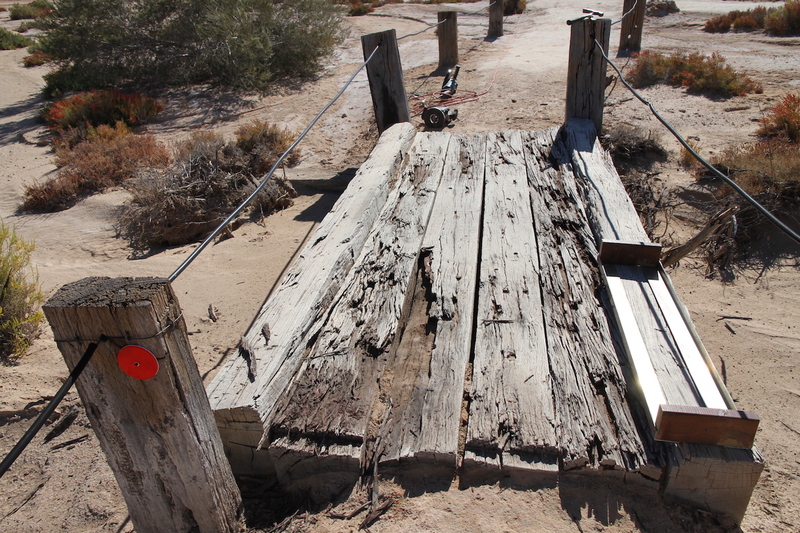 Measurements were taken and material for the repairs sourced from the workshop at Dalhousie Springs. 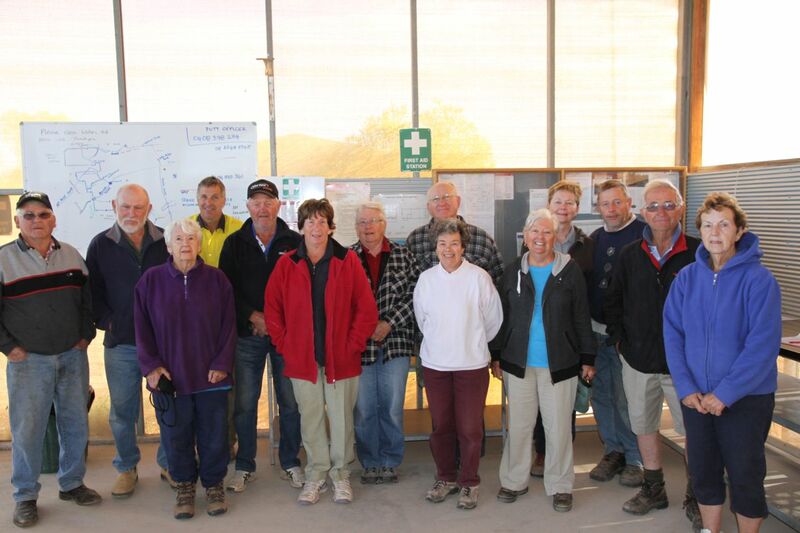 The same group of volunteers returned to the site at the completion of the Dalhousie working bee and repaired the damage to the bridge. 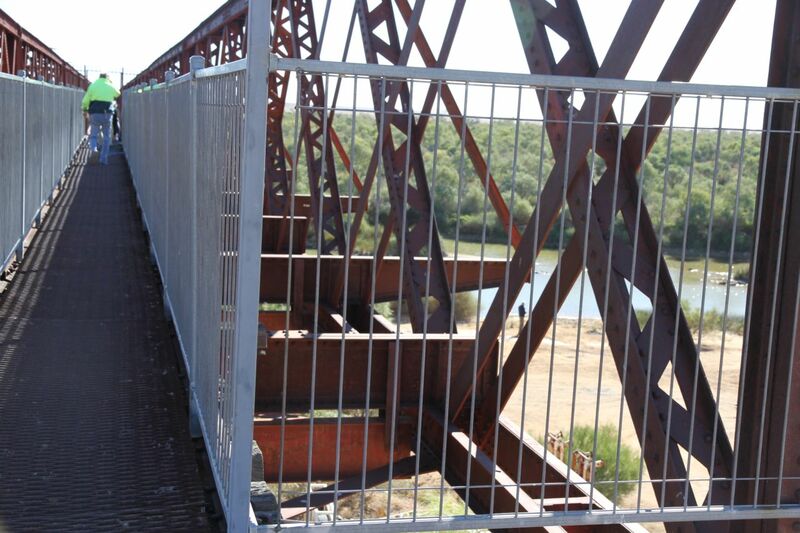 In addition, the mesh walkway was re-welded in several locations and the joints and the handrails were also repaired. The railway trolley was left in a damaged condition but firmly fixed to the rails with chain and will need another trip to make completely safe by DEWNR staff. 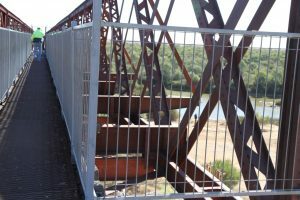 An inspection of the walkway bridges was carried out and an assessment of what was required took place. 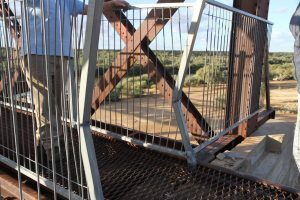 Only one bridge was able to be repaired and the others were deemed to be beyond repair and need to be replaced because it is not possible to put fixtures on them. The screws required to fix the new planks on top of the old wood (in their present state), would not hold long term. 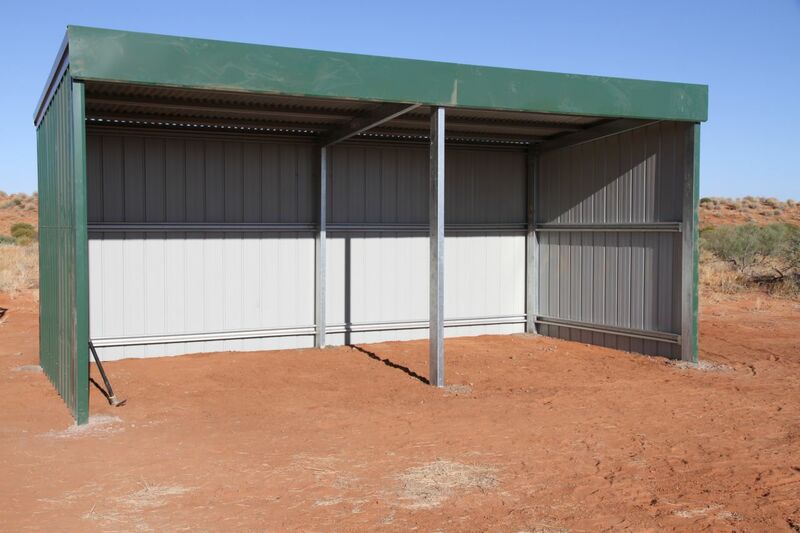 A decision was made to cover the walkways as well as possible until they could be replaced at a future working bee. The installation of the new planks over the top of the existing sleepers has raised the walkway levels considerably. Barrows of dirt were dumped to increase the height of the walkway making better access. 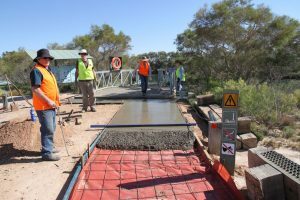 A new concrete walkway was designed and the area for the walkway was dug out, levelled and lined with salt resistant sheeting and re-enforcement added. The team worked tirelessly over a two day period and did a magnificent job. 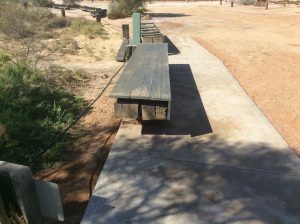 The two long seats were later put back in their original position and re-covered with new planks of recycled plastic on the top of the old wood. This will reduce the amount of dirt and stones transferred onto the steps and into the very sensitive Dalhousie Springs. 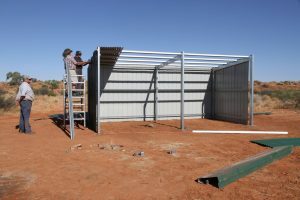 The installation of gutters onto the work sheds will allow the collection of rainwater into the new tanks, which will benefit the Witjira campground hosts and FOS members with additional drinking water in the future. A team of volunteers worked throughout the Dalhousie campground cutting back vegetation from the fence line and campsites. 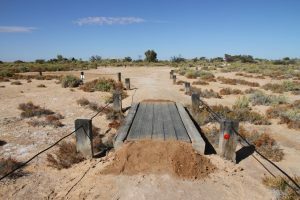 An additional area along the path to Medicine Hill was also surveyed to check the clearance needs of the walking trail. Some areas were pruned, but some of the larger overgrown bushes may need to be trimmed with larger equipment. The petrol hedge trimmer was a great asset and made light of hard work. The mulcher proved to be very good for the saltbush cuttings and dryer plants, but not for sticks of any thickness. The green clippings clogged up the machine. The mulch was spread around existing plants. Some work was also done around the Ranger’s houses in terms of picking up rubbish and cutting back plants with the brush cutter. The primer of the brush cutter needs repair. 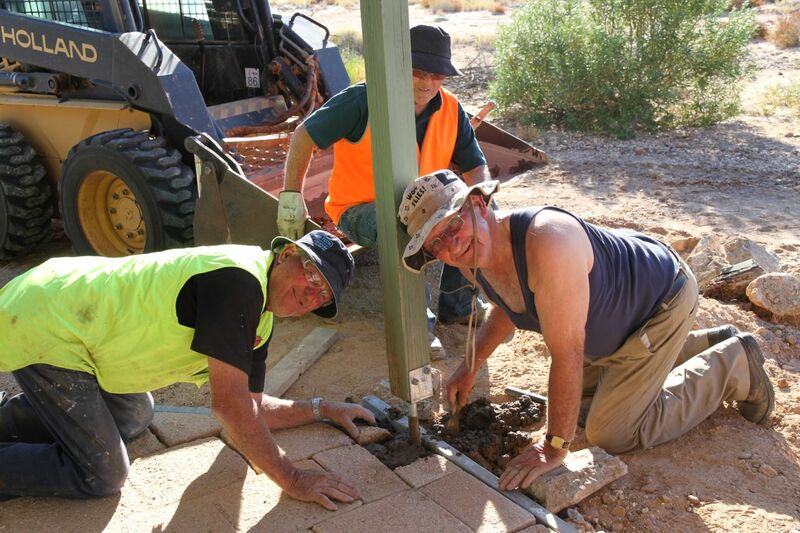 Four new plants were planted in places where one had died and the irrigation drippers are now working. 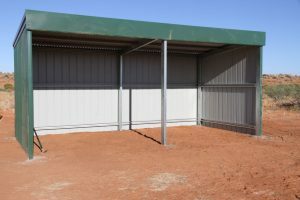 The creation of a new watering system and planting of new bushes along the boundary of the work sheds will, overtime create a new natural screen from the campground. An inspection of the plants/trees at 3 O’clock Creek found that most of them had died. The irrigation system to the plants had ceased operating. Some of the trees had been growing well but it appeared that they could not survive on their own. Many of the plants planted in 2016 by the Friends of the Mound Springs around the campground also have died. Extensive work was done checking the watering system and timers around the campground. The batteries were checked for their voltage as many were flat or expired. The drippers had a lot of calcification and they were all cleared of dirt and ants. In one location the Dingos had chewed through the irrigation hose. This was re-joined and fixed. All of the settings of the timers have been written down and placed in the dripper box in FOS lock up cage. Synchronized timing is happening in two different places, to increase the pressure of the water – i.e. early morning and late at night. Volunteers removed foliage, tidied up, pruned and checked the date palm regrowth and recorded GPS coordinates of the invasive palms for Rangers to eradicate later. It was not necessary to sweep or blow out the ruins buildings as very little litter has accumulated within. Very little regrowth of grasses or bushes were noted around the ruins buildings. Under guidance of the Senior Ranger Frank Lyman, members collected seeds from trees and shrubs at Witjira area. These will be propagated by members during next year’s working bee. 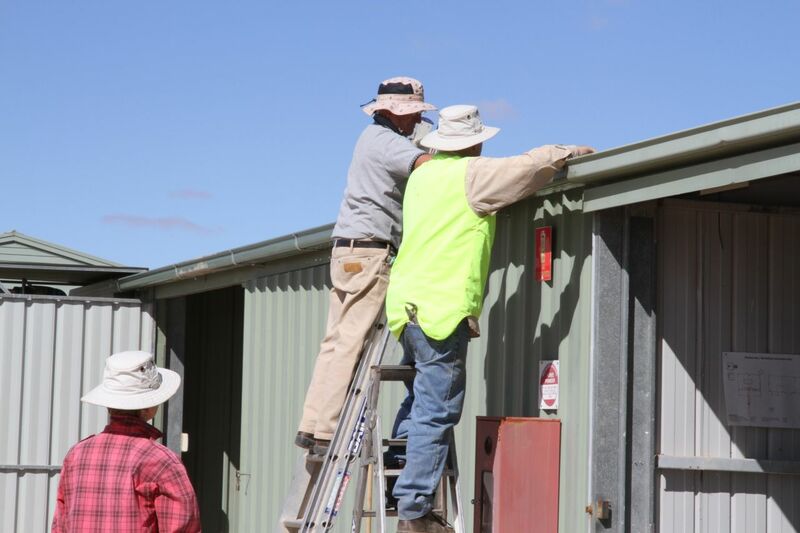 Members repaired and painted the veranda posts on the Ranger’s eco hut and office and cleared away foliage from fence line around the two ranger’s houses and the solar and diesel power generators areas. Volunteers installed a three sided shelter at Alka Seltza Bore which FOS members and DEWNR staff will use when working out from Dalhousie.